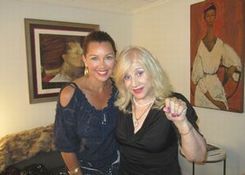 Vanessa Williams is an internationally acclaimed singer, actress,author and close friend of Psychic Maria Papapetros. During her recent summer 2014 tour of Japan, I had the wonderful opportunity to catch one of her magical performances and 4 interview her. Prior to launching this tour, Vanessa Williams had just finished her guest starring appearance on Broadway in the Tony winning musical "After Midnight." On this evening her performance of her hit songs and other great works were powerful and uplifting for the Tokyo Audience. Vanessa remarked that her experience performing on Broadway' s musical "After Midnight" was incredible. She also enjoyed the fact that her shows were scheduled in the evenings, which allowed her to spend the daytime hours with her family. When asked about her impression of Japan, Vanessa responded that she likes Japan very much and has been traveling to places such as Tokyo, Osaka, Nagoya, and Nagano since 1985. She noted that her Facebook page is full of many photos from and of Japan. In the immediate future Vanessa will be busy for shooting a feature film, other theater performances, and various creative projects. With her incredible schedule as a celebrity/entertainer as well as a full time mom, I asked her what keeps her motivated and balanced. She said her strong bond with family; love for her children, and desire to take on challenges keeps her going. On this tour to Japan she had brought her youngest daughter, Sasha (14) to accompany her. Vanessa said that she has been a close friend with Maria Papapetros for over 22 years. She highlights that Maria is a very active and down to earth person who has always given her very good advice. Maria and Vanessa have held several "Psychic Empowerment Workshops" at Vanessa's home in the past and both ladies are are looking forward to next collaboration. It is very clear that Vanessa and Maria have mutual respect for each other. Maria says that Vanessa is a wonderful person.